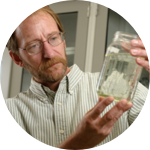 How do Daphnia tolerate hot temperatures? Aquatic ectotherms experience disjoint between oxygen availability and respiratory needs at high temperatures, because O2 solubility in water decreases, while metabolic demands increase with temperature. We hypothesize, based on O2 consumption and lipid composition data, that this limit is set by inability of mitochondria to maintain proton potential and propose to directly measure this in vivo using fluorescent microscopy. High temperature is a common stressor and a common selective pressure in nature. In a model organism Daphnia, a freshwater zooplankton crustacean this manifests in latitudinal clines of heat tolerance , indicating local adaptation. Organisms, including Daphnia can also show plastic response to heat, adjusting their physiology and biochemistry to allow higher heat tolerance [2, 3]. There is evidence that such acclimation is related to respiration [1, 3] and lipid composition , but no in-vivo experiments confirming this have yet been conducted. Rhodamine 123 is a commonly used fluorescent dye that targets mitochondria; accumulating up to 4000x in intact mitochondria it exhibits quenching and red shift, resulting in lower green fluorescence. It has not yet been used in-vivo. Daphnia is both a classic model organism in ecological physiology and an emerging model for ecological genomics. One of the key goals of ecological genomics today is to understand selective and plastic responses to changing environments, such as elevated temperatures. A protocol for in-vivo quantification of mitochondrial function in Daphnia will therefore be useful for a range of environmental, physiological and genomics studies. Testing the central hypothesis of the project - that higher heat tolerance in heat-acclimated Daphnia is achieved by their greater ability to sustain respiration at elevated temperatures - will be a milestone in the research aiming to understand ecological physiology of thermal acclimation and adaptation in a model crustacean. Goal 1 of the project is to develop an in-vivo fluorescent microscopy protocol to quantify mitochondrial membrane integrity in Daphnia, using rhodamine 123 fluorophore that is known to target mitochondria and detect mitochondrial dysfunction . Goal 2 is to use this protocol to test the hypothesis that higher heat tolerance in heat-acclimated Daphnia is caused by the ability to sustain mitochondrial functions longer. The experiment will include untreated high- and low temperature-acclimated controls, heat-treated individuals and individuals treated with a sublethal concentration of mito-toxin as positive controls. We have all necessary equipment and materials for the proposed experiment, but the necessary set of filters for fluorescent microscopy we have been using during the feasibility stage of the project is a loaner and we have to either pay for it or return it to the manufacturer. This is filter with excitation and emission wavelength that allow visualization and measurement of fluorescence intensity of rhodamine 123 dye that selectively accumulates in mitochondria matrix (resulting in fluorescence quenching and red shift), as long as mitochondria maintain membrane potential. We will validate direct in vivo measurements of membrane potential using Promega Mitochondrial ToxGlo™ and Lactate Glo™ Assays that measure ATP production and anaerobic respiration levels. The funds for the ToxGlo Assay are for a single-use kit. The funds for the fluorescence filter cube will support a long-lasting piece of equipment to be used by several labs in a variety of studies. This is a very important problem. With increasing temperatures on our planet we need to understand what determines the upper limits of temperature tolerance. Daphnia is a perfect model organism for this type of research. Understanding how organisms will respond to increasing thermal environments is a critical issue for modern biologists. We know that populations of Daphnia vary in their thermal tolerance, but we lack a mechanistic understanding of how some populations are able to deal with much higher temperatures than others. This exciting project will provide important insights into the underlying mechanisms of thermal tolerance. I like this project a lot. It asks an important question in animal ecophysiology, and the experiments to answer it are well-designed. Dr. Yampolsky is eminently qualified to perform this study in his lab. 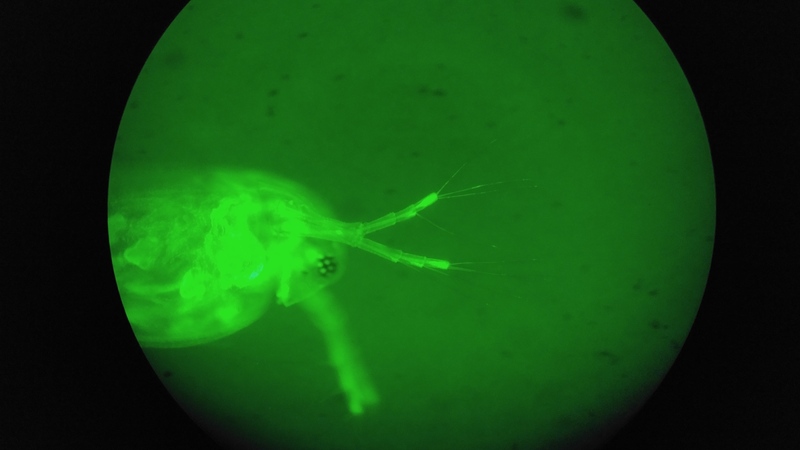 We are already on the way to achieving Goal 1 - see video showing live Daphnia neonate (left) and an individual treated with a mito-toxin CCCP (right), showing much higher fluorescence in the treated individual. We should complete this step by March 2018. Pilot experiments towards Goal 2 will be conducted in March-April 2018; the main experiment is planned for May-July 2018. Respiration rate and in-vitro mitochondrial function quantification experiments July-September 2018. 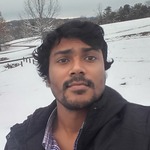 Rajib Hasan is a graduate of University of Dhaka, Bangladesh, who joined my lab at ETSU in the fall of 2017 as a MS student. 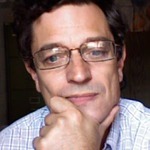 His interests and experiences are in evolutionary ecology of aquatic organisms. He is planning to continue on to obtain a PhD in ecological genomics or a related field. Undergraduate degree: Biology, Moscow State University, Moscow, Russia, 1986. Graduate degree: Genetics, N. I. Vavilov Institute of General Genetics, Russian Academy of Sciences. Postdoctoral appointments: Northern Illinois University, 1993-1994; Cornell University, 1994-1996; University of Georgia, 1998-2000; University of Maryland, 2000-2001. Daphnia neonate stained with rhodamine 123 fluorescent dye and visualized with 475nm excitation and 510 emission filter. Higher fluorescence is visible neural tissues, gut and filtering appendages relative to muscle tissues including heart.